The ceremony of the Last Post has been played at the Menin Gate in Ypres every evening since it’s dedication in 1927, interrupted only during the Second World War. Architect Reginald Blomfield’s memorial to the 54,897 men who fell in the Ypres Salient but who have no known burial is the focal point for the commemoration of the First World War in Flanders. Every evening at 8pm the Last Post is played and wreaths laid as a salutary appreciation of the cost of war in this south-west corner of Belgium. 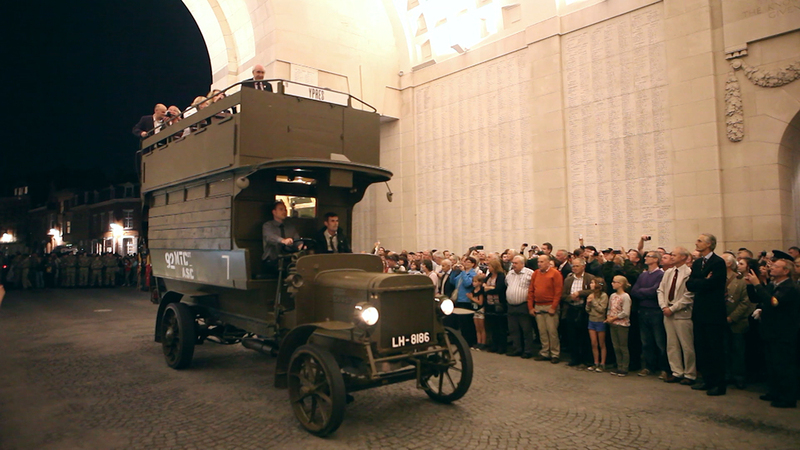 We were honoured to be invited to attend the ceremony with our 1914 B-type bus, perhaps the first time a vehicle has been included in this carefully choreographed act of memorial. As twilight drew in on Saturday 20th September, our Battle Bus in its khaki livery flanked by soldiers in camouflage dress formed a sombre backdrop to the five buglers in their bright dress uniforms. As the light faded, some 1,500 spectators were stilled to silence as the poignant Last Post echoed out under the illuminated lists of names of the fallen which fill every inside surface of the Gate. As the stirring notes of the Ypres Surrey Pipe Band fell away, Leon Daniels (Managing Director, Surface Transport, Transport for London) and I stepped forward to lay a wreath on behalf of Transport for London and the Museum to recognise the many transport staff who lost their lives in the conflict. After the national anthems of Belgium and Great Britain, the pipes and drums echoed round the Gate as the bands marched off towards the Market Place. B2737 coughed into life and with our little party aboard we followed them out of the brilliantly lit Gate into the town, raising a great cheer from the crowds of spectators. From the top deck of the bus, we looked back towards the Menin Gate, bright against the night sky. 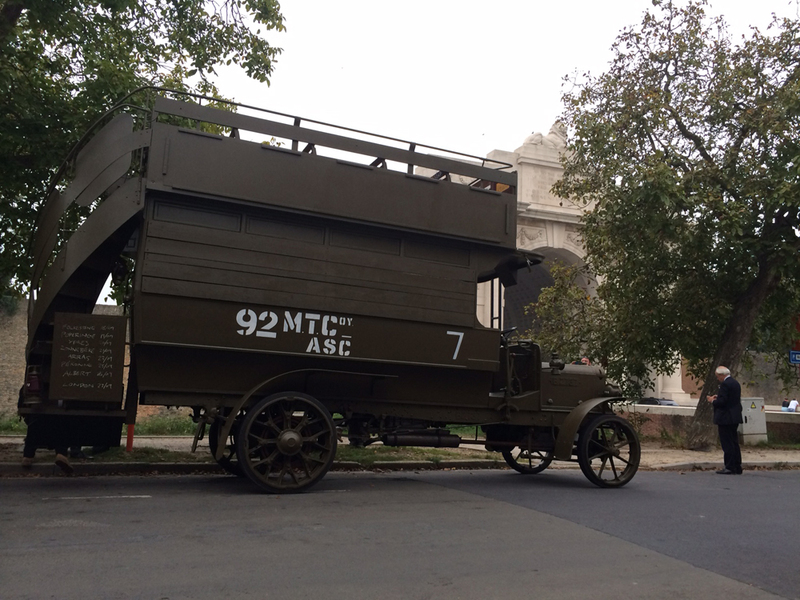 Battle Bus had returned to the Front, symbolic of the 1200 buses pressed into service, an emotionally charged touchstone for just one small story in the grim panorama of the Great War, a London bus like its drivers pressed into service in the maelstrom of war. This event had been in our minds ever since we conceived the restoration of a B-type bus. The transformation from red livery to khaki, the boarded up windows, the crude War Department stencilled markings and finally attendance at this emotionally ceremony of memorial, amongst the seemingly endless lists of names of the fallen, have symbolised the terrible outbreak of the War and shed a new light on its darkness. We are deeply thankful to the Last Post Association, the Heritage Lottery Fund and our many supporters for enabling such a profound link to be made between 2014 and the events of a century earlier. 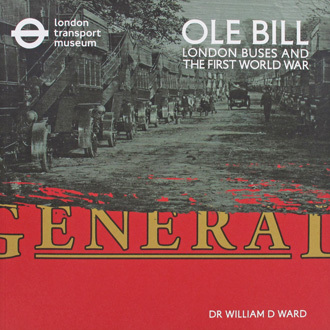 The story of London’s busmen at the front is also told in our new book by Dr William Ward, Ole Bill – Londons Buses and the First World War.